Florida’s Space Coast has historically been the epicenter of NASA’s operations for the last 50 years. Recent changes associated with the space program created some economic uncertainty in the region. This prompted many in the community to start rethinking the future relative to the location and type of industries likely to drive future growth. The Space Coast Transportation Planning Organization (TPO) sought our help to incorporate a scenario planning process into its 2040 Long Range Transportation Plan (LRTP) update to help community members revisit long term transportation priorities in light of some different ideas about how the region might grow in the future. With economic development as the driving focus for the 2040 LRTP update, one of the key questions became: "How can the County invest its transportation infrastructure and land use strategies to position itself for future economic growth?" Renaissance partnered with the TPO to develop a robust public outreach process that included public workshops, resident surveys and regular meetings with TPO elected officials and advisory committee members to develop different scenarios and discuss how each could best position the region for future job growth. 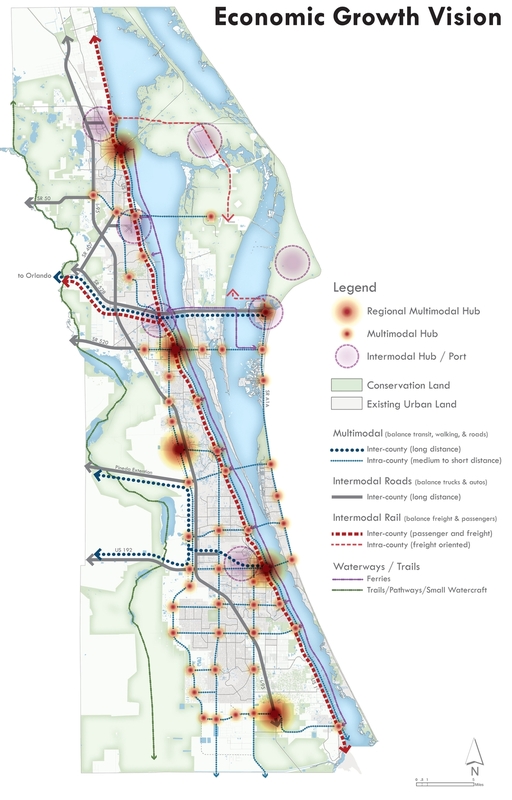 Scenario development included the use of CorPlan, a-GIS based scenario building tool and the regional travel demand model to create the visual and analytic information needed to convey how different transportation system options and land use patterns could be configured to support different economic goals. As a result of the scenario planning process, the policy framework of the 2040 LRTP update marks a departure from past long range transportation plans. The plan identifies multimodal transportation projects organized around different transportation corridor strategies that support improved access and mobility to various economic centers across the county. This strategic, place-based approach better aligns transportation investments with countywide economic development and livability goals.